This question is the top of the list of FAQs from the general public, and should therefore be avoided if possible. Other things we might find it a bit difficult to smile at are “Pull the other leg, it’s got bells on” and vocal renditions of “Jingle Bells”. The prize for originality goes to Tracy Stubbs of Abbots Langley who, in 1983, pointed at our bell pads and remarked “I like your leg-warmers.” Can you do better? None of St Albans Morris is called “Morris”. Sorry. 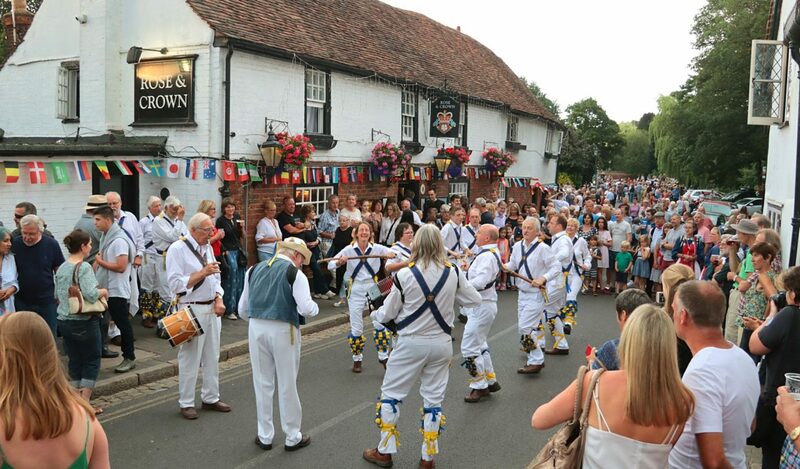 Why is it called “morris dancing”? That’s an interesting question! No-one really knows the answer. If you want to impress your friends, tell them that it is a corruption of “Moorish” (from the Moors of North Africa), coined at a time when everything Moorish was fashionable at court. It may not be true, but they are going to be hard-pressed to argue with you. The truth of the matter is, again, we don’t really know. John Forrest’s “The History of Morris Dancing, 1458 – 1750” (ISBN 0-8020-0921-2) says that the first unequivocal reference to morris dance is in a will dated 1458. Alice Wetenhale of Bury St Edmunds bequeathed to her daughter Catherine “three silver cups, one sculpted with a morris dance”. How much resemblance morris then bore to what we do now is another question. That comes under the category of “Frequently Argued Questions”, and you would be well advised to leave it to the experts. Are you going to drink all those? That’s an easy one! Yes. We might even be persuaded to have another. Are you offering? Because it’s fun, that’s why! Morris dancing has many of the advantages of a sport, without some of the disadvantages. It’s good to keep an ancient tradition alive, but there would be little attraction in that if it were not enjoyable in itself. We like doing the dances to the best of our ability, and our pleasure is multiplied when we have an appreciative audience. I bet that keeps you fit, doesn’t it? Potentially! Keen members of the club can be out there dancing at nearly every opportunity, whilst the more relaxed members can savour the peripheral advantages of The Morris. Really enthusiastic members train to keep fit for dancing (and go skiing for light relief during the winter): really laid back men cogitate on their drinking/dancing ratio. Come on, now, don’t you have no ‘omes to go to?